I was comparing 5 sniper rifles to see how their damage drops with distance, and i noticed the damage graph only shows to about 90 meters of distance. For regular guns that may be enough but for snipers 90 meters is very short range, and some of the differences between snipers can't be seen in that small distance. For example CS5's damage stops dropping at 100 meters (59 damage), while FY-JS's damage stops dropping at 147.5 meters (36.6 damage). 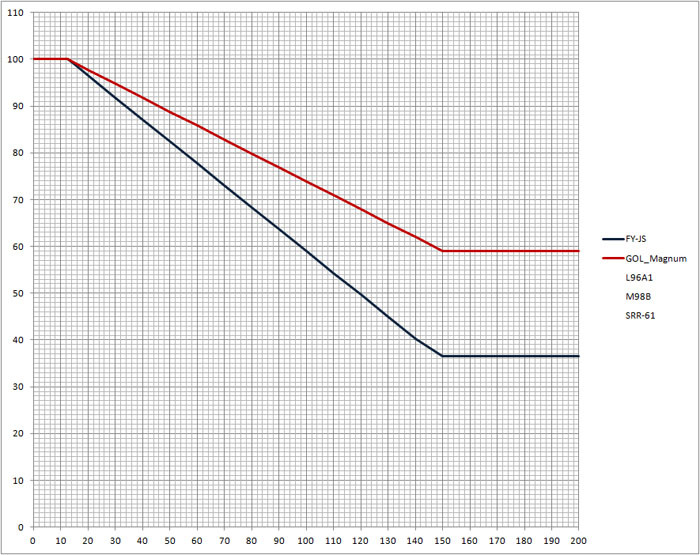 Such a big difference is not at all visible on the graph, due to it showing only up to 90 meters. 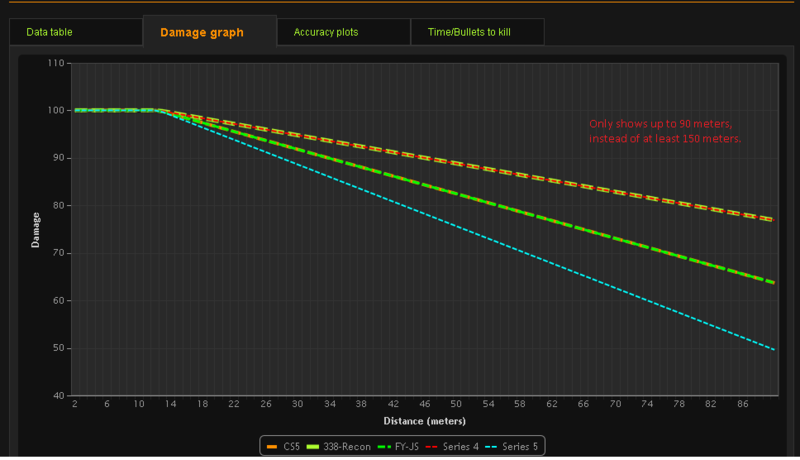 Is there currently any way to increase the distance shown in the Damage Graph, at least to 150 meters? If not, please consider adding this feature - it would be very useful in reliably comparing sniper rifles and other long range weapons. Valid point there, especially when snipers can share very different damage models like that. Hoooowever the system wasn't built on having dynamic range on those graphs so modifying that would be quite a bit work and probably breaks thing or two on site before we get it right. Increasing the distance would make rest of the weapons look weird with 80% of straight line. So unfortunately you have to survive by looking at the numbers directly or using the small DoM images on charts (they have dynamic ranges). Could it be done to have a completely separate "long range damage graph" (up to 150m) tab that users could click on, just like they currently click on the regular damage graph tab in the multi-comparison? I understand it is a niche use, but perhaps completely separating the two graphs might make it easy to implement? Maybe for Symthic v5 I will write more dynamic views for DoMs and whatnot. I am planning on doing that during summer and do the backend from scratch again (based on current one so outlook is the same). Perhaps these graphics will be useful. 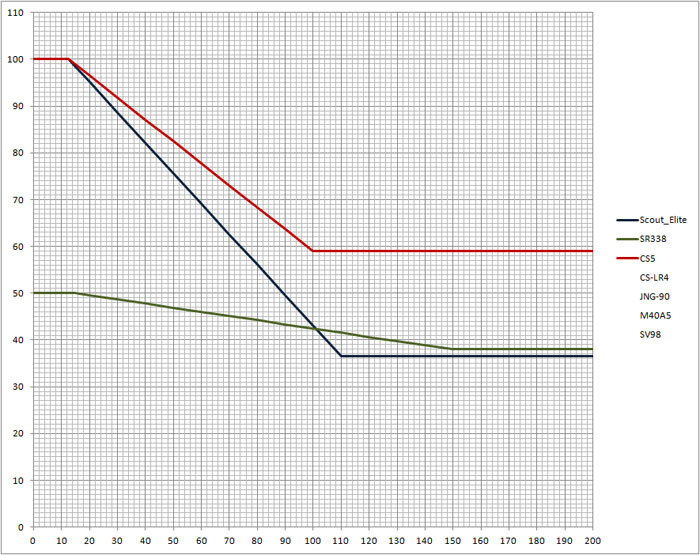 Actually there are only five classes of DMG-drop (beside pickups). One of the big things to remember, is that when using the FY-JS or the Scout Elite at their max ranges and beyond, they will not kill with a headshot. You can select the weapon from each category, then the range at which you would be engaging an enemy. Or VLOOKUP for column choices. I think that in other spreadsheets there will be equivalent functions. If the values change you have only to change them in the table_array without having to edit the cell. To place correctly the parentheses is a hell!! !